KATHMANDU, July 3: “Every Nepali and most of the parliamentarians ride water boats, specifically a 15-rupee water boat everyday”, Prakash Rasaili, a Member of the Parliament from Nepali Congress, told the parliament on Monday. He was referring sarcastically to tempos that travel through the streets of the capital which remain waterlogged due to heavy rain and resemble more like rivers than roads. Many lanes and major roads in the capital get filled with water up to a foot high. Walking through the streets is irksome as there is a constant risk of stepping on puddles. Much of the roads are covered with mud and dirt, making roads extremely slippery and prone to accidents. Former secretary Kishore Thapa said that there are lots of defects in road designing in Nepal. Rain water patterns have been miscalculated and roads haven't been elevated sufficiently, obstructing the natural flow of water. Thapa, who now represents Bibeksheel Sajha Party, added that many roads in the country are non-engineered. Road construction is carried out in an unplanned manner, without any proper survey and monitoring of rain water conditions and road gradient. The government uses dozers to open tracks in rural Nepal as per their desire without considering the ecological effects. In the name of development, roads are being constructed haphazardly without even consulting with engineers. 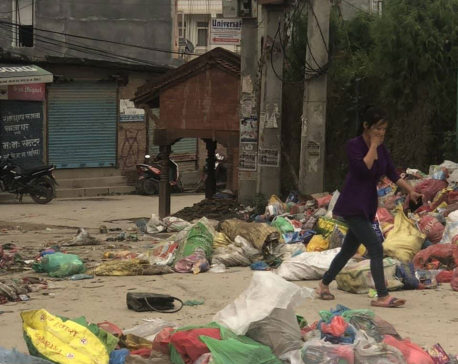 “This is not development, but devastation,” Thapa added. Stakeholders have blamed the government of consistently neglecting safety issues and overlooking possible hazards while constructing roads. Most of the roads lack proper drainage system. However, the government isn't the only party to be blamed, says Bhai Kaji Tiwari, development commissioner at Kathmandu Valley Development Authority. According to him, the locals of Kathmandu Valley are also partially responsible. The drainage system which has been constructed in the valley is solely for water collected in the streets. However, locals mix water from their households into the drain because of which flooding occurs since more amount of water enters the sewers than their capacity. “Once the Melamchi Drinking Water Project gets completed, the severity of the problem is sure to increase,” said Tiwari.